"Tide Turner" 5 Bedrooms, 5.5 Bath, each bedroom with its own full bath. 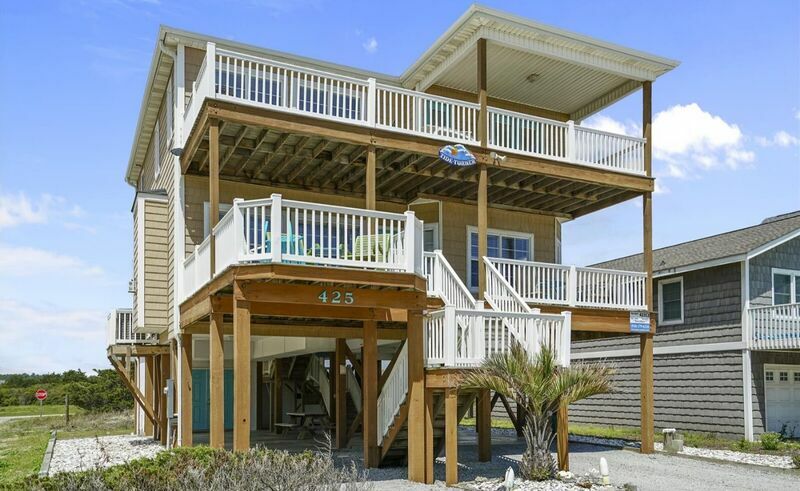 Located on the beautiful east end of Ocean Isle Beach near the Ferry Landing Park. Take a stroll on the east end nature walk through the tranquil marshland behind the home. Ocean and ICW views from large decks (covered and sun porches) which run the width of the house, upstairs and down, front and back, with lots of rockers, lounges, chairs, grill and picnic table. Built-in table and seats in the back yard area. Each bedroom opens directly to a deck and has a ceiling fan and window for ocean views and breezes. Two-story living area floods with sunlight and ocean views. Decorated in unique beach themes throughout, 6 cable televisions, large flat screen in living area, 2 DVD players and high speed internet provided. Fully equipped kitchen, with dishwasher, microwave, Keurig Coffee Maker. Washer/Dryer. Jacuzzi tub in master bath. Hot/Cold outside shower, renter's storage and gas grill on ground level, and unique outdoor seating area. Non-smoking. Accommodates 12. King, Queen, Queen, Queen, 2 Doubles. All bed and bath linens provided with the rental rate. A fabulous beach house with all amenities. Great view and so convenient to the ocean. Very spacious with plenty of bedrooms and bathrooms for a large family. The house was very clean, modern and beautiful decor. Any kind of kitchen appliance, dishes, pots, etc. were all there. Definite 5 Star. Will go back again. We picked Beach Therapy because we had 6 adults,2 girls 68 and a 11 year old boy. We were attending a wedding and a bunch of us came in from out of town but we wanted a little space so we picked the opposite side of the island. We arrived at sunset and it was beautiful. When we walked in everyone was surprised at how nice the place was. We quickly picked rooms and explored everything. There is everything you could ever ask for in the kitchen. Every room had its own bathroom that coordinated with the room. Even though the master was the only room to face the ocean, the other rooms had beautiful sunsets to watch and tons of space. The kids loved the stairs and the fact that they were up in the double queen room you could barely hear them. My inlaws loved there room was upstairs and tucked away so it was like there own little cove. The master is so comfortable and the deck facing the ocean made for the door being open almost every night. We were here when the 1st tropical storm of the season hit and it was a crazy experience. I was happy that we were not right on the ocean because the 2 house on each side on the ocean suffered damage. We were able to watch the storm from our deck and felt super safe. We will absolutely be back. I had to make 3 familys happy and this place more then exceeded our expectations. Love love love it here!!!! This was our first time staying at this house at OIB & it was just what we wanted ?? the house wasn't as clean as it should've been but we made it work. The house itself was awesome! Loved the decks - spectacular views! The common areas had enough space for our large group. And of course the beach was divine. Not crowed - lots of waves & sun. Even saw dolphins everyday. We had a ball! We'll be back ??????? ?